In a perfect world, we'd get all the protein we needed from real food. And for those of us whose mouths water at the thought of a thick, juicy, medium-rare steak, getting protein from real food probably isn't much of a problem (though I do supplement with whey protein shakes because steak right after workouts tends to not happen nearly as much as I'd like...plus protein shakes are just so convenient). Protein's a little trickier for my vegetarian and vegan friends though, since while animal sources of protein tend to be complete proteins (includes all essential amino acids), plant sources are usually incomplete, and you have to mix and match plant proteins in order to get all of your essential amino acids (for example, beans and rice combine to make a complete protein). There are exceptions, like quinoa, which is considered a complete protein, but even mighty quinoa has a lower Protein Digestability Corrected Amino Acid Score than say, whey and casein (from milk), eggs, and beef. Vegetarians and vegans may turn to soy for protein, but soy is such a controversial food right now that many people want to avoid taking in more than they already do. So what's a vegan to do? Well, if my several of my fellow chiropractic student friends are any indication, PlantFusion may be an option. I tested the Unflavored PlantFusion. Each 30g serving of Unflavored PlantFusion has 120 Calories, 2g of fat (0g saturated fat), 390mg sodium, 60mg potassium, 4g carbohydrates (4g sugar), and 22g protein. It also includes 22,000mg of their proprietary protein blend, and 100mg of their proprietary enzyme blend (presumably to help break down the protein and raise the PDCAAS score). PlantFusion is also available in Vanilla Bean, Chocolate, Chocolate Raspberry, and Cookies N Cream. All of the flavors have very similar nutrition facts, with some minor changes in sodium, potassium, and perhaps a 1g protein difference, and obviously some added flavorings. All of them seem to have a short, friendly-looking ingredient list. Nutritionally, PlantFusion seems to be comparable with whey protein, having a similar-ish amino acid profile (there are some amino acids where whey is higher, and some where PlantFusion is higher), and having the same PDCAAS score of 1.0. However, I don't know how rapidly PlantFusion is absorbed, considering both whey and casein have a PDCAAS score of 1.0, yet whey is absorbed rapidly and casein is absorbed slowly. It supposedly also has a better nutrition profile than soy, but I have to admit that I'm not super familiar with soy protein since I don't generally use it. In addition to not containing any animal products, PlantFusion is also free of many common allergens, containing no wheat, gluten, dairy, soy, nuts, or fish. I started off by following the directions of adding a scoop of PlantFusion to 12oz of water in my Blender Bottle. It mixed up pretty easily, without any clumps of protein powder, though it did have more foam than a Guinness that I had to allow to settle down. I took a sip, and...ugh. Not tasty, unless you like the taste of chalk. I guess that's not surprising, since any protein powder added to just water is pretty gross...most of them seem to need milk. In the spirit of keeping this drink vegan, I went with Almond Breeze vanilla almond milk (so it's not longer nut-free, but it remained vegan and gluten-free...I guess if you wanted to keep it nut-free you could use hemp milk or rice milk or whatever else people seem to use). Another sip and...slightly better, but still not good. Then I remembered that my friends who use PlantFusion's products usually buy the flavoring powders that Wegman's has conveniently placed right next to them on the shelf. Seeing as I didn't have any of those flavoring powders, I added some cocoa powder (black cocoa powder that I got in bulk from the local Amish store, in case anyone is wondering). This was a definite improvement, though I still wouldn't call it delicious, and I'd take my trusty Optimum Nutrition Gold Standard cookies and cream flavored whey over this any day. To be fair, this was the unflavored PlantFusion (though the front of the packet still boasts that it has an "amazing taste"). Hopefully the flavored ones taste better. It might also be good if you hide it in a smoothie with plenty of fruit (and yogurt if you don't mind ruining the vegan thing), but I only had one packet and didn't have a chance to try that. You would need a blender (rather than just a Blender Bottle) for smoothies though. 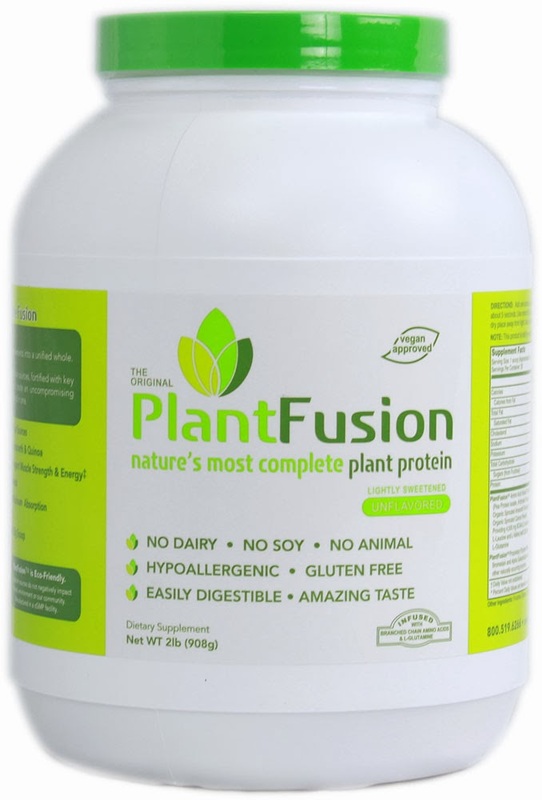 PlantFusion is certainly a good alternative for vegans (and vegetarians who avoid dairy) who are looking for a convenient way to get protein. It has an excellent nutrition profile, and the ingredient list is short, natural, and not-scary looking. However, it's tough for me to fully recommend something that seems to require added flavorings in order to be even halfway palatable. I guess taste is subjective though, so it might be worth a try if you're vegan and can't use whey protein (people who are lactose intolerant can generally handle whey isolate, since unlike concentrate, the lactose is filtered out). PlantFusion retails for $26.99 for 1lb or $42.99 for 2lbs, and can be located in stores by using the locator on the website. PlantFusion also offers a meal replacement drink called Phood, which I have not tested but seems to be pretty popular with my friends (moreso than the PlantFusion protein reviewed here, but PlantFusion is more in-line with the whey protein that I'm currently using). Full disclosure: One of my friends who is a fellow chiropractic student gave me a sample of this to try. She is not associated with PlantFusion (and neither am I). The opinions expressed in this review are mine and based on my experience, and do not reflect the opinions of PlantFusion, my friend, or anyone else.